LO_12_21 BANNED AT CITY HALL! Papers will still be available throughout the city, and we move the 300 papers from City Hall to put into home delivery. Why dd City Hall ban John Litten talking about a beloved pediatrician who recently passed away? Fifth Graders writing about their experience with their dads at Emerson's Father Walk? You? 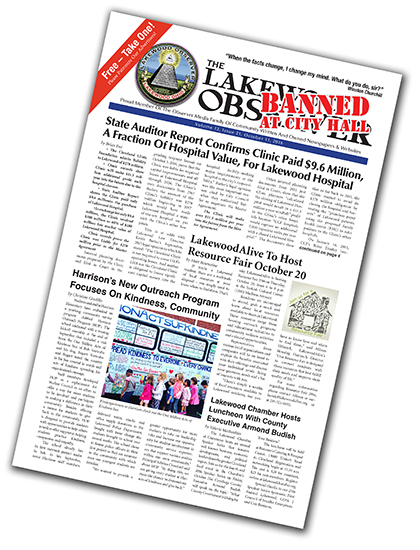 After 12 years and 309 issues, the Lakewood Observer has been banned from City Hall? The Lakewood Observer has been awarded four Resolutions for the good and honest publication we have given the community. The Lakewood Observer has received three commendations from the Ohio State School Board for honesty in reporting, one from Senator Sherrod Brown. Lakewood’s Chamber Business of the year, LEAF’s best supporter. Together with our volunteers we have generated hundreds of thousands of dollars in media, and donations to the Friends of Lakewood Library, the Schools' two bond issues, three levies. We worked with Ed FitzGerald on getting rid of backyard trash collection and he wrote a glowing review to investors about how much the Lakewood Observer, and the paper meant to the community and City Hall. But nearly from Day One, the Summers Administration has seen the Lakewood Observer as a danger to his plans, and the plans of his friends. The plans to liquidate Lakewood Hospital valued at $180 million dollars into almost NOTHNG for Lakewood and millions for friends and a still yet to be named non-profit run by Whom? One of the very first things done in this administration was to change the time Lakewood City Hall keeps documents from 3 years to 2 years. Cost was seen as the reason. A 5 TB hard drive costs $129! One of the next things was trying to get rid of that pesky 3-reading rule, so that things could be fast-tracked with “Emergency Votes.” Another way to keep citizen response, questions and participation down. Then they moved into fighting nearly every public records request, first with a canned answer, “Too broad and sweeping” to "Those documents are privileged," even though they have been shared with others. But what comes next is the most ignorant move yet. An effort to marginalize and shut down the Observer Project, so City Hall decided to stop sending in their information. Many do not realize this but the Observer has given City Hall three pages to get their information out, unobstructed. But that was not good enough, they hated that we published opposing views. Opposing views to theirs, to mine, to anyone's. It's a community-written paper, that's the nature of the beast. Then starting last week came talk that the paper version of the Lakewood Observer should be marginalized. They like to say "the paper version," as they have already attempted to marginalize the uncensored online discussion board called “The Observation Deck.” After all nothing good comes from people talking about their differences in the open?! And now, the Lakewood Observer print paper featuring stories from City Hall, kids, politicians and residents, BANNED in yet another effort to hide the facts, the discussion and just how bad they have gotten. One of the major aspects of the Lakewood Observer project is that it's a great community assessment tool. You get a great overview of what is happening, why, and who some of the players are. This bothers many, as they prefer to work the shadows and the dark hallways of City Hall. But together we not only get a better understanding of what is going on, but why and by whom. This latest ploy by Mayor Summers underlines just how bad his deal with the Clinic is, and how desperately he needs to cover it up. Twelve years ago Lakewood celebrated open discussion, democracy, civic discourse and better understanding. This administration has worked to destroy that, to bring the community to the edge of Civil War, and worked and spent over a million dollars to control, confuse, and misinform you. That is City Hall spending your tax dollars on lies and cover-ups. That is your money being used to misinform you, about the biggest deal in Lakewood’s past 50 years. The liquidation of our largest employer, our downtown anchor. Turning nearly $300 million in assets into $16 million for friends. We will continue to amplify the voices of all Lakewoodites, so that we can work together with understanding to make Lakewood better. As always thank you to our editors, writers, photographers, readers, and most of all our advertisers. Re: LO_12_21 BANNED AT CITY HALL! Thanks to all the writers, editors, and photographers that made it possible. Strange that Summers would ban this issue....it has numerous fluff pieces from "Team Summers" members like Jim Kenny. The "Team Summers" piece on the Lakewood Dem Club is especially laughable. I try hard to focus on positive things. My own article in this current Observer is but one example. Despite all of the things happening in Lakewood, particularly involving Lakewood Hospital and Issue 64, which I regard as dismally negative: I really believe the essential issue is that we have an amazing city which can do so much better, and should. 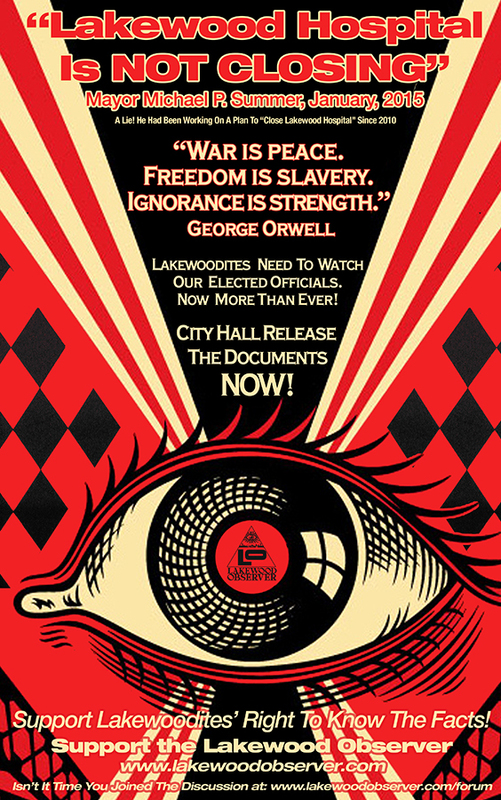 And now City Hall refuses to admit an issue of the Lakewood Observer within a public building? Enough is enough. At some point belief in "good people on both sides who all want the best for our city" stops being credible. At some point it doesn't matter whether or not every individual personally took part or even supported given activities; at some point, choosing not to speak out against abuses of power becomes the same thing as supporting them. Particularly for persons who are in positions of authority, themselves, like our city council members. The nice, good, well-meaning people For 64 need to take back their campaign, or else make it clear that they are no longer participants in it beyond parallel, independent support of a common goal. I assume the Observer will continue to publish articles by our elected officials and City Hall employees. I do hope that there will be a notice at the bottom of each page that proclaims the ban. mjkuhns wrote: I am tired of this. Everyone who posts on the Observer should also be aware that, YET AGAIN, our posts and comments have been COPIED AND PASTED into yet another court document. The latest filing in the lawsuit against the Observer has numerous threads from the past week copied and included in the EXHIBITS section. See the last filing made by attorney Rachel Lyons on Oct 11. Are we in the Twilight Zone? In some alternative reality? How is it that, in America, our right to speak freely is seen as "dangerous" and subject to prosecution as part of a lawsuit? Maybe someone should tell those lawyers that this is America, not the Soviet Union or Communist China. We don't need no self-appointed censors monitoring our every word for something that might cause offense. I would like to correct some part of this ongoing story. Yesterday afternoon at 4:30, I received a call from City Hall, that indeed they had also removed and thrown out issue 12/20. That after 307 issues, and a positive working relationship with every mayor, including this one until the Hospital Debacle. Probably the most upsetting part of the entire discussion was the need to know, which employees said that. Three different people asked for Lakewood Observers between Thursday and Sunday, all were told the paper is no longer available there, they have been told no longer. I myself stopped by after the calls came in from residents that we had been banned, I went down to "restock" and was told, the papers will not be allowed in City Hall. The Lakewood Observer received no messages, calls or notification, that the papers were no longer allowed. Melissa claimed it violated rules for City Hall, that have been in place for years. She also said "Only the Mayor can ban it, and he didn't"
Then one would think only the Mayor can let it back in. So Mayor Summers, how about the same deal offered by Mayor George, Mayor FitzGerald, let the voice of open discussion ring. Stop the ban! Stand with us for free speech and open discussion. Mike stand with the Lakewood Observer. Re the "Democracy in action at Lakewood Dems meeting"
I wonder if Chitra Walker will get the boot for breaking their new rule about no media. I know of one pro-hospital person who held back writing about the meeting possibly out of "respect" for the rule. Wow! I thought City Hall was a Public building owned by the tax payers of Lakewood. I guess Lord Lakewood has spoken! I would suggest that anyone who is able or has the time to walk the sidewalks outside of City Hall and the hospital with signs, should do so. God knows there is plenty to protest! I find it amazing that Summers friends always come crawling out from the woodwork at election times or when Summers is having a hard time defending himself. Most times it does not involve any kind of intellectual discussions on their parts either. Summers is too much of a coward to speak for himself, so he hides behind his faithful followers and lets them spew his BS. I believe that Summers is trying to control anything and everything about his alleged illegal schemes from getting out to his citizens in Lakewood. The alleged immoral and illegal theft of Lakewood Hospital, the alleged money laundering of OUR money, the alleged stealing and tearing down homes in Lakewood, including historical homes,and those who cannot protect themselves, such as the elderly, terminally ill, Blacks, Hispanics, Aarabics, etc. This is just the beginning of the alleged schemes that Mr. Summers and his Extended Family are involved in. When the time is right, they will be exposed. Mr. Summers, I believe it is time for you to step down from your throne and relinquish your crown. 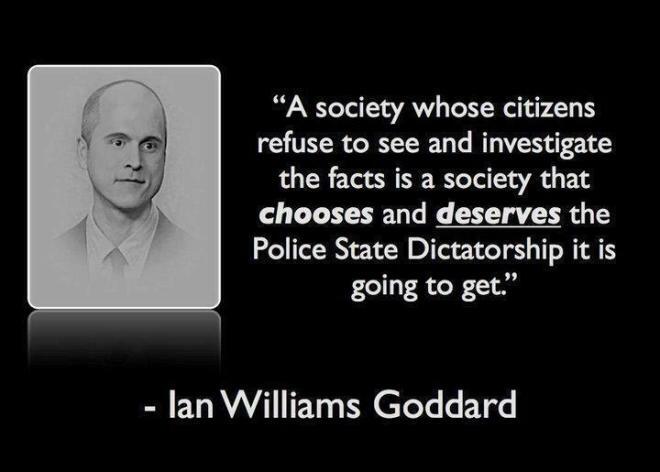 I believe you are unfit to serve. An alleged crook such as yourself, Council and friends need to set up your tents somewhere else. When the story breaks, it will be in the Observer. Gee Mr. Summers, I guess you will have to get your copy elsewhere since you, the almighty king, have banned it from City Hall! Now we will all prepare for the back lash from Mr. Summers Deck watchers! John Litten just posted on Facebook a picture of the LO available at City Hall. Was this just another one of those false and misleading headlines that you guys like to post? You rascals! Who told you it was banned and who banned it. I read your post and it doesn't have that info. If you look a little closer you will see that Jim said he got a call from city hall. Did Mr. Litten post an explanation with the picture? You know... like after having been embarrassed by the puerile and vindictive nature of the Summers' administration I decided to sneak a dozen copies of The Observer into City Hall. Did he post anything or was it just a still life of copies of The Observer?
" City Council is a 7-member communications army." Colin McEwen December 10, 2015. No one connected with the Observer left papers there after we were told not to. I have two witnesses and one audio tape. I posted the explanation that Melissa Garrett told me. She had removed the issue before and told the desk people not to allow them at the Desk, where we had been allowed for 307 issues. We have had a working agreement with City Hall since we started. They get 3 pages, we get circulation, stories, and access. She said, "only Mike can Ban the paper, and he didn't." I said that's great that mean he can get them back on the Desk honoring both of our commitments to open discussion and celebrate the City of Lakewood. Maybe we are arguing over semantics. But it happened, the words used were "banned." Melissa said we will work it out, I have called twice, no return call. I like Melissa, I believed her, still waiting for that return call though. I find it laughable that Councilman John Litten loves talking about the Lakewood Observer something he knows nothing about, but seems to never talk about his part in the closing of the Hosptial. Hey John, supporting the Observer, how about 1,600 words of truth about the LHA deal? What actually happened is that many calls and the ACLU and others took notice. City Hall someone went and got issues and put them in there. That's great, but it is not the deal we had made, and the reason given is lame. Yet another big blunder and cover-up by City Hall. I said the hospital is closing, he was part of spending $1 million assuring us it wasn't. John Litten has an account here, stop by tell me your story, I got a couple questions. Masthead stands, efforts proceed until they call, and we work it out. Maybe residents roll over for their BS, I am not. Besides, the story with photos is ready for the next issue. Patrick Wadden wrote: Jim, John Litten just posted on Facebook a picture of the LO available at City Hall. Was this just another one of those false and misleading headlines that you guys like to post? You rascals! Did Mr. Litten post an explanation with the picture? You know... like after having been embarrassed by the puerile and vindictive nature of the Summers' administration I decided to sneak a dozen copies of The Observer into City Hall. Or does he suggest the opposite, that The Lakewood Observer was never banned from City Hall. Did he post anything or was it just a still life of copies of The Observer? I have two witnesses and one audio tape. I posted the explanation that Melissa Garrett told me. She had removed the issue before and told the desk people not to allow them at the Desk, where we had been allowed for 307 issues. We have had a working agreement with City Hall since we started. They get 3 pages, we get circulation, stories, and access. She said, "only Mike can Ban the paper, and he didn't." I said that's great that mean he can get them back on the Desk honoring both of our commitments to open discussion and celebrate the City of Lakewood. Maybe me are arguing over semantics. But it happened, the words used were "banned." Melissa said we will work it out, I have called twice, no return call. I like Melissa, I believed here, still waiting for that return call. I find it laughable that Councilman John Litten loves talking about the Lakewood Observer something he knows nothing about, but seems to never talk about his part in the closing of the Hosptial. Hey John, supporting the Observer, how about 1,600 words of truth about the LHA deal? What actually happened is that many calls and the ACLU and others took notice, they got some and put them in there. That's great, but it is not the deal we had made, and the reason given is lame. Yet another big blunder and cover-up by City Hall. If John Litten is saying I am lying...I said the hospital is closing, he was part of spending $1 million assuring us it wasn't. John Litten has an account here, stop by tell me your story, I got a couple questions. Masthead stands, efforts proceed until they call, and we work it out. Maybe residents roll over for their BS, I am not. Besides, the story with photos is ready for the next issue. 2. Given this Streisand Effect happening, that belies the claim of the resident troll that no one reads The Deck. No readers, no internet, no Streisand. Yet here we have Streisand in action. And if we have Streisand, we must have a lot of readers on the internet. Yay!